It's wet and chilly here in Northern California this evening, but I'm sitting in my apartment with all of the doors and windows open trying to rid the place of the lovely odor of burned chocolate croissant. I meant to put it in the microwave for 12 seconds, but accidentally set it for minutes. No chocolate for me tonight. Last week I took my niece Lily to a park for the first time. My sister Hil, Lily's mom, told me that Lily loves the toddler swings, and she wasn't kidding. I was overwhelmed with emotion watching the happy look on her face as I pushed her back and forth. I knit that pink hat before Lily was born, about a year ago, and never cared for it. In fact, I deleted it from my Ravelry project page so I wouldn't have to see it again (forgot to delete it from my blog). But I happened to find it in the pocket of her stroller when we were at the park and lo and behold, it's actually kind of cute. I finally came to a decision on what to knit for Lily with the Debbie Bliss Cashmerino I bought at the Stitches market last weekend-- this matinee jacket from one of my favorite knitting books, Vintage Knits for Modern Babies. I've completed a few inches of the back, and so far so good. Another project I'm working on is this silk scarf for myself. 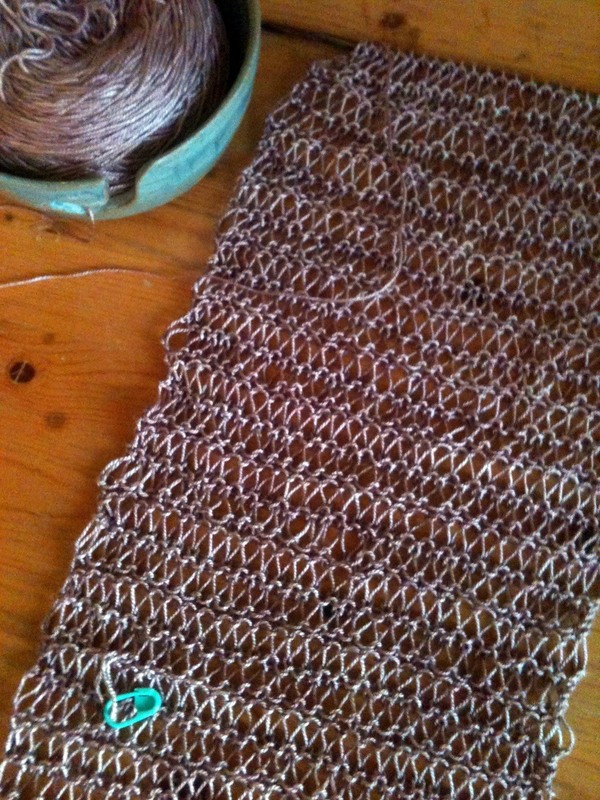 I first wrote about it back in January, but have since frogged it and changed to a drop stitch pattern. It's slow going, but I'm plugging away. I thought that stitch on the holder was dropped and wasn't sure how I was going to fix it, but it was just loose, thank goodness. Must have caught on something. I'm so sad that Picnik.com is going away in April. I use it to edit all of my photos before posting them and love how easy it is to use. It's great for reducing the size of your photos and brightening them up. I guess I'll have to learn how to use Picasa. If you are a Downton Abbey fan and are having withdrawals, Anna at Thimbleanna has posted a list of suggestions from her readers that might help fill the void until season three begins. I want to suggest one more that isn't on the list-- Masterpiece's Sense and Sensibility from 2009. I like it better than the older version with Emma Thompson and Hugh Grant because the cast is younger and fit their parts better. In the new one Dan Stevens (Matthew Crawley from Downton Abbey) plays Edward Ferrars, and he is yummy with those gorgeous blue eyes. Hope you are having a good week. We completed a big project at work this week, so I am taking Friday off to celebrate recover. I love that version of Sense and Sensibility as well, a great list thanks for sharing! I really love the new scarf, it is gorgeous! Sweet picture of Lily:) I love that sweet little hat! Enjoy your day my friend! Can't wait to see your scarf all finished:) HUGS! It sounds like you are enjoying being an aunt! Lily looks just stunning in her little hat! Enjoy your long weekend and happy knitting. Oooh, thanks for another great suggestion -- I'll add it to my queue. Luckily, Netflix has so much to offer that I haven't seen -- so I'll be busy for a long time! 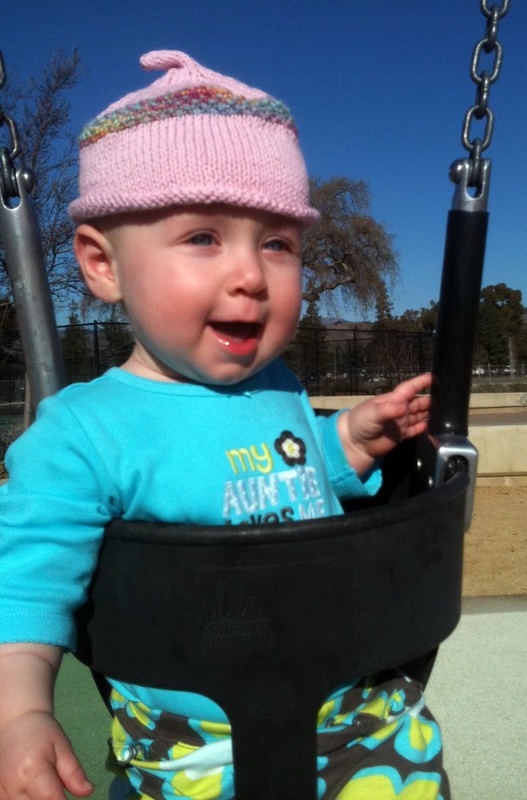 Love that adorable swing picture -- what a little cutie!!! What a little cutie pie! Little Lily looks adorable in her hat. I was sad about Picnik too. My hubby just told me about Paint.net. Haven't tried it yet, but it may be an alternative. You have been busy! You have the perfect model in Lily! How fun to knit for her. I am going to check out the list - I reckon I've seen most of them. I like that version of S&S also. I plan to watch it with my daughter when she comes home next week. That and a James MacAvoy marathon....Over fall break is when we discovered Downton!